It's probably an understatement when I say: I love plaid. In fact, plaid is my favorite color. If you were to Google "plaid" last summer, chances were that you'd see my mug (dressed in plaid of course) in the image search. Chances are, I'm wearing plaid right now. 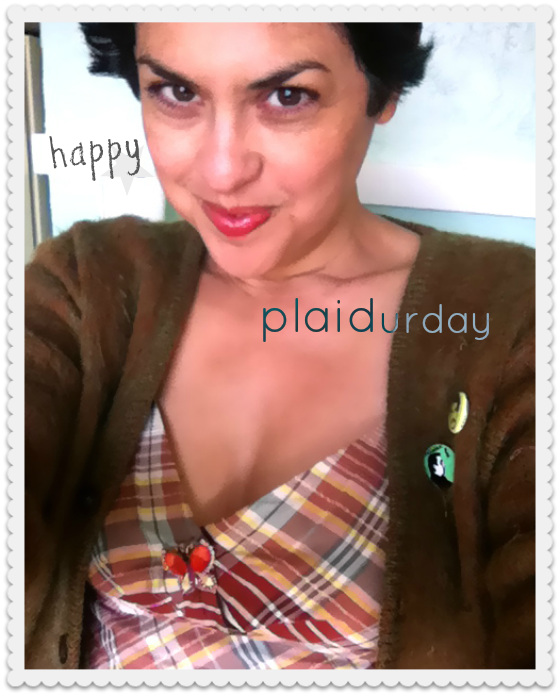 So when the second annual celebration of Plaidurday rolled around, of course I'm on it. What a great holiday for a terrific pattern. Perhaps, plaid is a state of mind. A lifestyle. An attitude. A plaid-itude if you will. Whatever plaid is to you, I invite you to celebrate it with me, today. Plaid is such an unusual design with such width of expression. I've seen plaids that I adore, plaids that are okay, and plaids that bore me. The best of 'em are as good as anything else. I love plaid so much! I actually wore a red plaid dress today (I'll be posting it tomorrow) and I didn't even know it was Plaidurday! You look gorgeous in that first picture - timeless and lovely! Plaid is certainly a lovely color on you darling!! You are totally pwning Plaid, Bella. Fantastic collection of looks! Oh wow! Are you the inventor of Plaidurday?? I had no idea it was Plaidurday, or I would have done something to celebrate! Love that first photo of you! You look radiant!! Gorgeous collection showcased in this post, stunning photos! You look terrific in your plaid. I'm more a polka dot or stripe girl myself, but you rock the plaid! only if it's Pendleton. Geez, I sound like a snob! You are rocking your plaid Bella. I always thought it was called tartan until I had the blog, lol. I am so glad to see you happy, my dear Bella. I love plaid, thought I do tend to call it tartan. I want to see more of that dress you're wearing though! How cute you are on that first pic ! Plaid is great !! I particularly applaid your cape. Wow. You're beaming. I also forgot to say congrats on your big move. This is incredibly exciting - our instincts save us! Plaid (or tartan) is a print that reminds me a lot of the 90's and I adore everything from that period! But now I realized that I own only coats and shirts and no dresses, as I love your blue one in these photos I really hope to find soon a similar one!!! you look so gorgeous in plaid!! i adore your cape!! so stylish as always!! I call it tartan, too! Us Brits, always so complicated with our language! I can play this year as I have a cape! 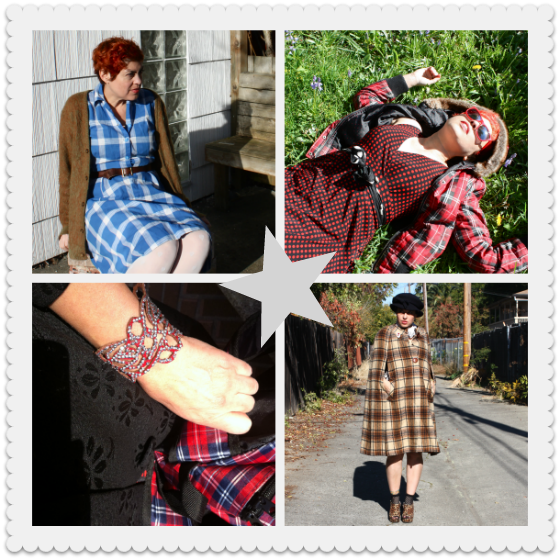 love your great plaid-itude!, more plaid is never enough! I think I'm also on a plaid mood, because you're right: plaid is a state of mind!! I just found out about Plaidurday, but am following it on Facebook now. 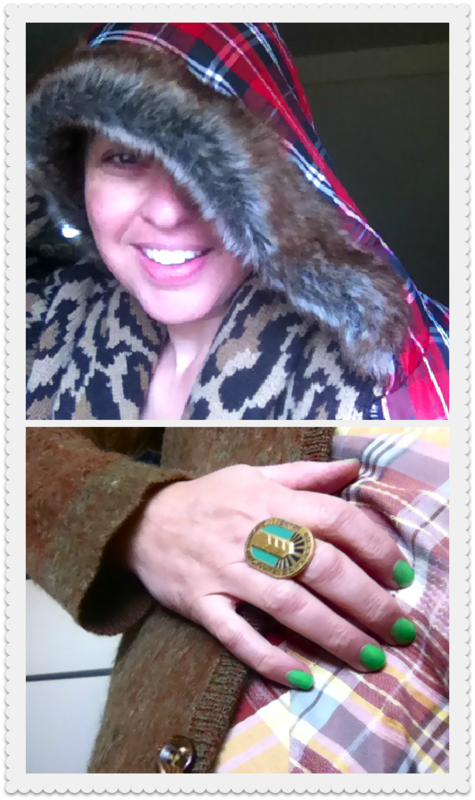 Which gives me a whole year to thrift something plaid that is not wool since yesterday it was 84 degrees here. You rock plaid! I love the first photo best. You look full of mischievous fun. I do love plaid. I love that it's your favorite color! Ha! Google translate suggests: plaid. Nice cape, and I agree with the above writers that you are very pretty in the first picture! I might just have to pull out some plaid myself today! Happy plaiderday Bella. I had no idea there was a Plaidurday, although I think it's a great idea. The only plaid I have is a heavy, ankle length wool cape, so I will have to wait and celebrate it belatedly when it's cold! I love you in every one of these photos. Plaid certainly suits you Bella Q! xo! The title made me giggle. There's a super cute plaid skirt in ASOS I'm totally eyeing up. Darn, I missed out on plaidurday, but it was fun seeing a some other bloggers celebrated. Yes, I've seen your many shades of plaid. You're indeed a mad plaider or would that be spelled Pladder? Hello Bella Q! My name is Victoria and I am a writer of Sacramento Fashion Week. I have to say I really am enjoying your blog the Citizen Rosebud. I hope you keep up the amazing work you are doing on here. I do have to say you can never get sick of plaid and I love how you called it a "lifestyle." Hope to see more blog posts from you soon.